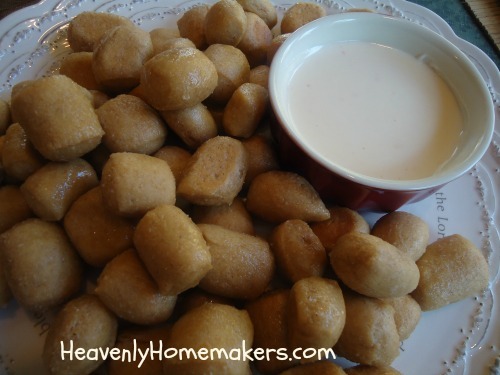 But with these Homemade Soft Pretzel Bites? So delicious! What’s fun about this recipe is that you can make it as spicy or as mild as you like. In fact, our family made individual bowls of the cheese dip, then added as much hot sauce as we each preferred. In a medium saucepan, slowly melt cream cheese and cheddar cheese cubes on medium low heat, stirring constantly. Once melted, gradually add milk and whisk together while continuing to heat. Once the sauce reaches the consistency you desire, remove from heat and serve - adding hot sauce to taste. My boys were so impressed that I was able to make something that tasted so much like the canned fake cheese dip. But never fear – because this is made with real ingredients, it tastes much better than what comes out of a can. Let’s take a vote: Who likes the cheese stuff that pours out of a can? Love it? Hate it? Don’t feel bad admitting that you like it. We all have our lingering non-food cravings (says the lady who still chooses Nacho Cheese Doritos when given the opportunity). But speaking of Doritos and Velveeta (which we weren’t actually speaking of but hang with me here). If you want to avoid cheese from a can and cheese from a box – but you really love Nacho Cheese Dip – I have a recipe you are going to love! After years of trying, I came up with Real Food “Velveeta” and Rotel Dip. You guys. This recipe changed my life and I now make this dip every couple of weeks because we love it so much. I exaggerate frequently and am sarcastic often – but I am very serious about this dip. So there you go. You now have two amazing homemade, real food dips to try so that you can forever and always avoid processed cheese. Amen and amen. Yum!! Will be making this for an appetizer for a number of gatherings the next two months. Hopefully it keeps well in the crock pot. Thank you! My boys love that fake stuff too! Now I will have a much better alternative to offer them! Thank you!!! Looks wonderful! Is this like the Velvetta/Rotel sauce that is unbelievably delicious with chips? I’m thinking if you added the rotel, it would be a close imitation of the fake stuff. Just wondering how runny this is…. Ya know, that might just work! It’s not super runny, and you can make it as thick or runny as you like depending on how much milk you add. Ewww…we do not like the stuff that comes out of the can/box/jar…particularly the “V” stuff. Can’t wait to try this FOOD version. Thinking I’ll add jalapenos too :) Thanks! I can’t wait to try this for my “Easy-cheese” loving son! I am going to get some pretzel dough started right now! trying this(and pretzel bites)this weekend! 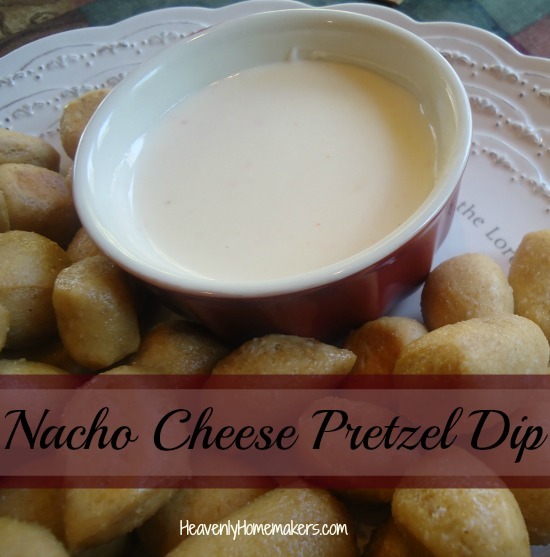 !think it will make all 7 of my kids pretty happy….especially my oldest who still has fond memories of forbidden snacks.lol..he always tells the younger kids…momma used to let me eat Doritos..lol thanks again for another great recipe!!! The is awesome! I can’t wait to try it! Oh yum! Thank you SO much! I can wait use this to make nachos (loaded with veggies :) I love the fake stuff in the jar. I haven’t bought it in years, but I wouldn’t be able to resist it as a party, LOL. Now, I can introduce my girls to the yumminess of nacho cheese! I do like that old can stuff. Don’t use it very much any more though. Just wanted to let you know I made your raspberry bars today. I already had my butter out and soft so I did not melt it. It seemed to work fine. I am going to make them blackberry after while. My DIL loves blackberry. We were very happy with them. I just made garlic breadsticks what a happy coincidence to get this in time for dipping sauce! Thank you for this and all your recipies and tips , for both food and life! Laura, I have thought it before, but I will say it… you are the bomb dot com! Thank you for making this deliciously low brow food that my family (secretly) LOVES!! This might just be the easiest Mac and cheese ever. More milk, of course, but nice for anyone who misses velveeta macaroni. Made this cheese dip today (but added some frozen diced jalapeno! )and ate it on a big old plate of nachos. Delicious! I was dubious at first the the cream cheese and cubed cheddar would melt down smoothly, but it worked great! Thank you for the recipe! My MIL just gave me a recipe for a yummy broccoli rice cheesy casserole that called for the jar cheese. I’ve been putting off making it, but now I might just try it with this for one of our Thanksgiving meals. Thanks! We had this tonight after evening church and it was a fast, yummy dinner – nachos!! I loved that it was REAL food!! Thank you for sharing!! Many blessings to you & yours!! Anyone tried freezing this? I’d love to make a batch and freeze it with a batch of bite sized pretzels. I had just started looking for a recipe for real food queso online when I got your blog update in my box. Perfect timing :). I’ll be adding some healthy ground beef, a bit of salsa, serving it over tortilla chips and calling it dinner! Can’t wait. Grain-free cheese sauce! Must try this :-) Thanks again, Laura! I have the hardest time giving up crunchy snacks like pretzels, chips, etc. Do you have any awesome recipes for crunchy snacks? I mean what do you serve with a sandwich besides chips??? I still have a ways to go to be truly whole food….this will go great with those chips I can’t give up…ha!!! Thanks!! When I’ve made ‘real cheese’ sauces the past few times, it doesn’t really stick together…consistency is weird :( This may work using cream cheese…I’ve used 2% Organic Milk in the past- is this the problem maybe? Do I need to use Whole Milk? 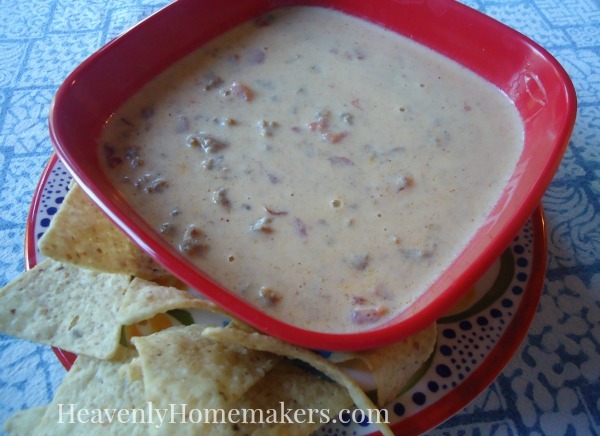 I have a super pick son who LOVES cheese dip so I’d really like this to turn out! I love this! Since I discovered your recipe, I have made it 3 times in the last 3 months… It’s just me eating it, and I portion it into 1/2 cup servings and freeze it, and it is so gratifying to know I can heat and eat it whenever I want. Last time I thawed my last portions and seasoned it with a little garlic and onion powders and a hint of cayenne and took it to a pretzel party and people gobbled it up! Thank you for your adventurous recipe work! Mmmmm, mmmmm, mmmmm!????????? And, OH YES!!! It freezes JUST FINE!!! I love the cheese dip recipes! Do you recommend any soft pretzels available to order or buy premade. Or do you have a recipe that you like to make from scratch?